We’d love your help. 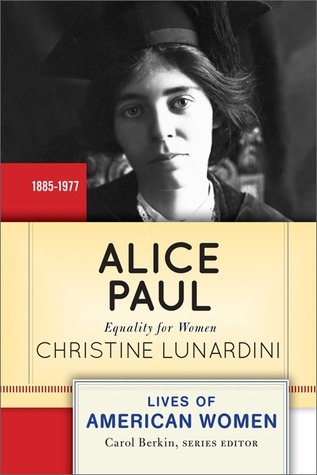 Let us know what’s wrong with this preview of Alice Paul by Chris Lunardini. To ask other readers questions about Alice Paul, please sign up. In some ways, a biography with incredible potential. I came in knowing nothing about Alice Paul and now feel much more knowledgeable. It has wet my appetite to learn more. I had no idea direct advocacy and grassroots work played such a role in passing the 14th amendment. Why don't they teach us useful things like that in school? This book is immensely interesting, but also immensely boring. It is a short read but felt ridiculously long. I kept forcing myself to come back because, while I was gai In some ways, a biography with incredible potential. I came in knowing nothing about Alice Paul and now feel much more knowledgeable. It has wet my appetite to learn more. I had no idea direct advocacy and grassroots work played such a role in passing the 14th amendment. Why don't they teach us useful things like that in school? This book is immensely interesting, but also immensely boring. It is a short read but felt ridiculously long. I kept forcing myself to come back because, while I was gaining from it, I was not enjoying it at all. Part of the problem is the writing. It isn't very readable or easy to get through. Another problem is the size. Because this book is so short, it barely touches on a whole lot of things. It almost needed to be longer to be more manageable, but I don't know that I would have finished something longer. Alice Paul did amazing things but this author is so ridiculously in love with her (apparently she can do no wrong and should get credit for all women's political progress) it's boring and annoying to read, which is a shame.